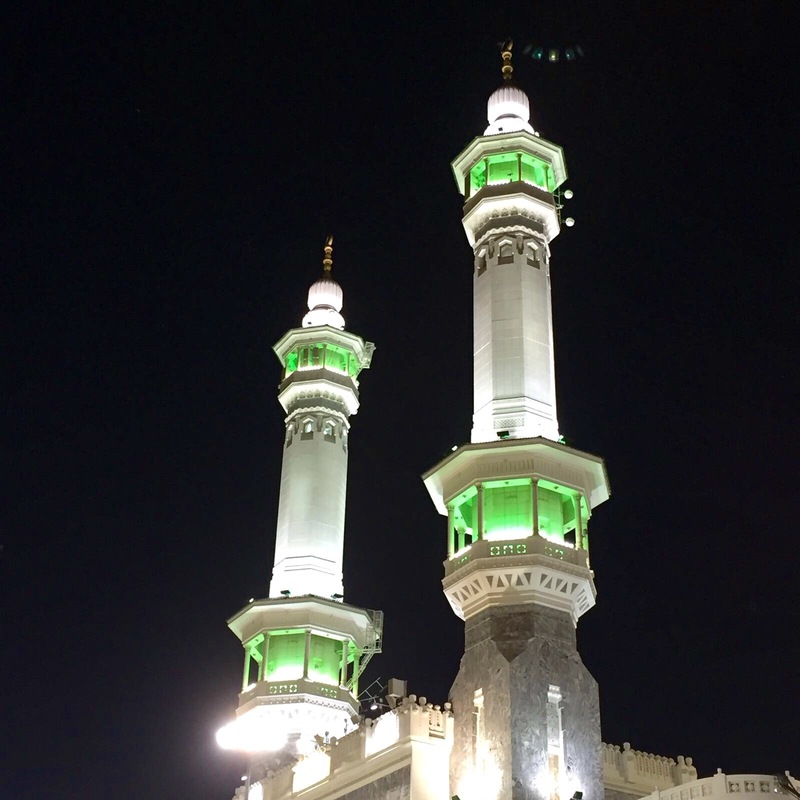 It’s been just over a week since I returned from Umrah, and I think it is time to let you all know about my Umrah experience. 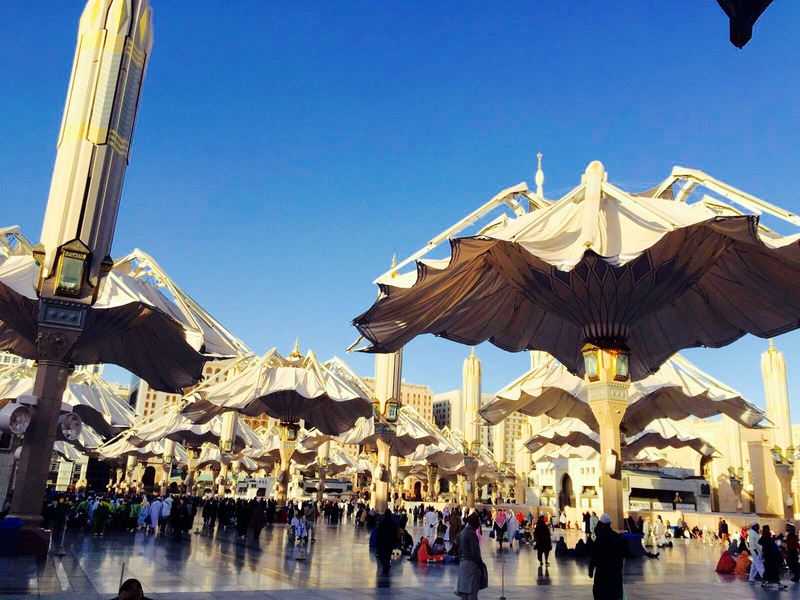 I documented how I felt before going in this post: Going Away for a While, which you can read to gain a better understanding of what Umrah is and my feelings of returning back to Saudi Arabia. 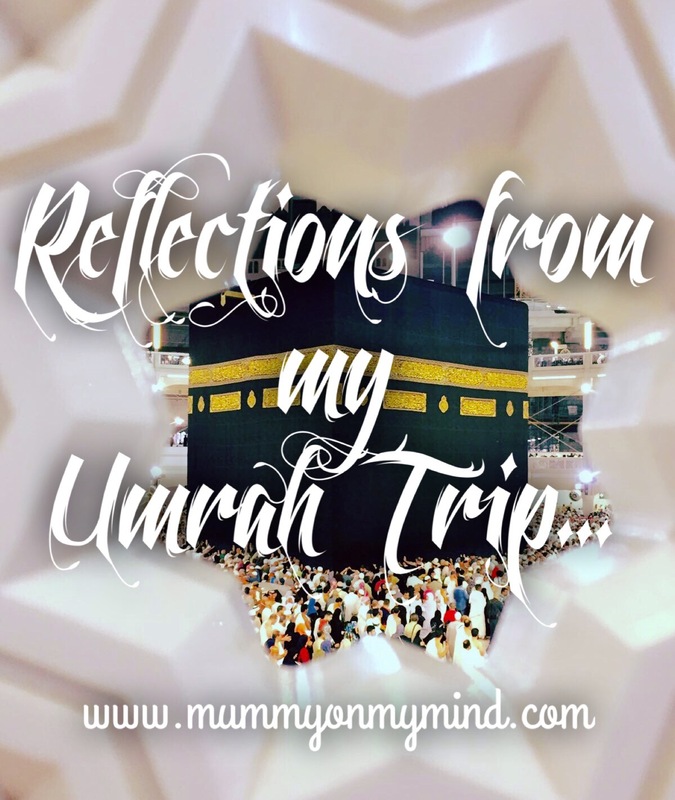 Since returning, I have also written about the seven types of people Baby Z encountered during Umrah, and I would love to know what you thought about that! Our travels began on 28th January, when myself, Mr Z, Baby Z and my mother-in-law flew to Madinah Airport, with a short 3 hour flight. I say short because our last flight with Baby Z was to the UK and lasted 7 hours. The horror! 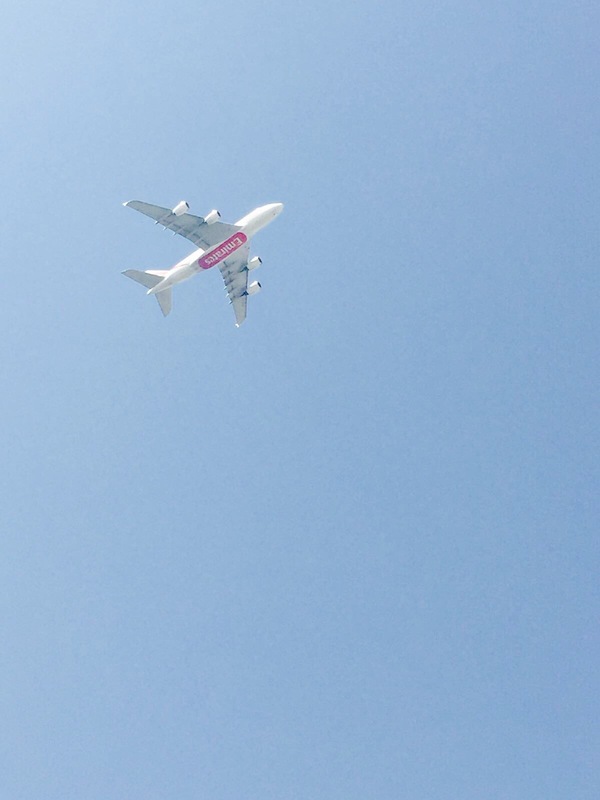 So in comparison this teeny weeny little flight caused no issues as Baby Z pretty much knocked out for his nap straight after landing, and woke up with about half an hour to spare. I must say I was very impressed with Madinah Airport. It was clean, crisp and very white. The breeze was lovely and we reached our hotel within half an hour of being picked up by our driver. I had forgotten just how rash the drivers can be in Saudi Arabia and found myself gritting my teeth and holding on for dear life on more than one occasion. Thankfully, we all survived. Our hotel in Madinah was a very short walk to the Prophet’s Mosque (Masjid-e-Nabwi), and opposite the iconic green dome and Salam Gate. Madinah was so peaceful and I absolutely loved the ambiance. It was absolutely freezing though, with temperatures dropping to 3 degrees Celsius during Fajr time (sunrise prayers). I was so glad we packed all our jumpers and winter wear, and I was literally wearing two pairs of extra thick woolen socks whenever I stepped out of the hotel. Baby Z didn’t take to the whole praying-in-a-mosque thing too well. For the first two days, he was one of those children that would wail their hearts out during the entire adhan, as well as the jamaat prayer. This was mainly because he is not a big fan of loud sounds, and the sounds of the adhan really was quite loud, both in and out of the mosque. I tried all the tricks, bribery, snacks, and car toys available but he would have none of it. Thankfully, from the third day onward Mr Z devised a plan to pray whilst holding him and letting him down slowly, and it worked. Baby Z slowly grew used to the sound of the adhan as well as our routine of going out for prayer. It was a major break through to actually be able to pray with the jamaat. For those of you that don’t know, there is an area inside Masjid-e-Nabwi known as Riadhul-Jannah, meaning Garden of Paradise, or more commonly known as Rawdah. It is located between the Sacred Chamber and the Pulpit, approximately 22 by 15 metres in size. There were specific times allocated for women to enter in to this area which was after Fajr prayers and Isha Prayers, and as you can imagine the crowds that gathered were immense. The first time that I went, I managed to enter into the blessed Rawdah area but was swept aside and out by the tide of moving people. I returned the next night after Isha prayers and was blessed to offer 2 rakats in prayer within the Rawdah carpet area, distinguished by its green colour. Though the organisers of the Masjid-e-Nabwi did their very best to control the crowd, I was shocked to see the nature with which people would get carried away in such a sacred area. Our location of the hotel, though close to the Salam Gate itself, meant that we were opposite the major hub of restaurants and other amenities, where the clock tower was situated. This made hunting for food quite a challenge. However, once we had our food, it was so peaceful to sit on the white marbled Haram floor and take in our surroundings. Baby Z found people-watching rather amusing, but the water dispensers proved to be his favourite. After 4 days in Madinah, we travelled to Makkah for the main purpose of our visit. The Umrah. 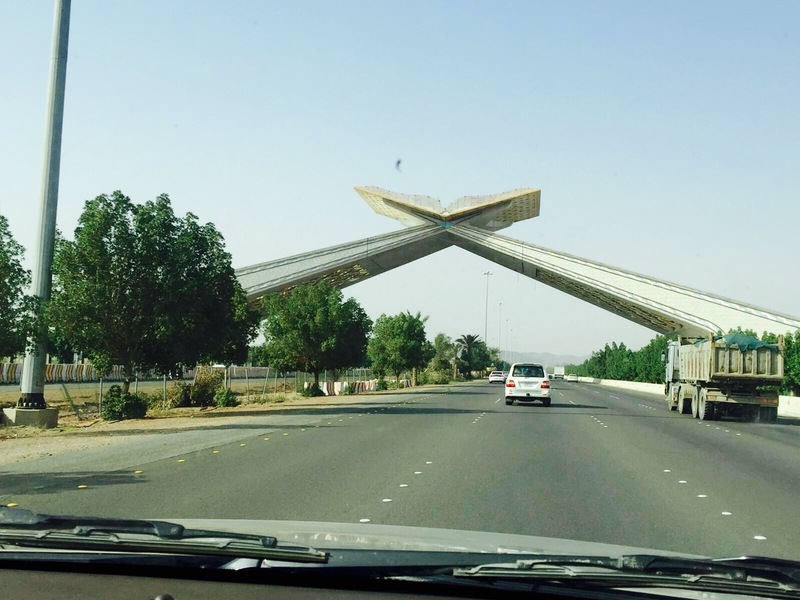 It was a long drive, made complete with pit stops for Miqat (a stated place for pilgrims to make their intention for pilgrimage and wear Ihram, the pilgrim’s garment) as well as food. We also made a quick stop by the road side to feed wild monkeys, which was possibly Baby Z’s highlight of the entire event! We arrived at our hotel at around 5 pm, just before Maghrib prayers, so we quickly got ready and entered Haram Sharif to begin our Umrah. 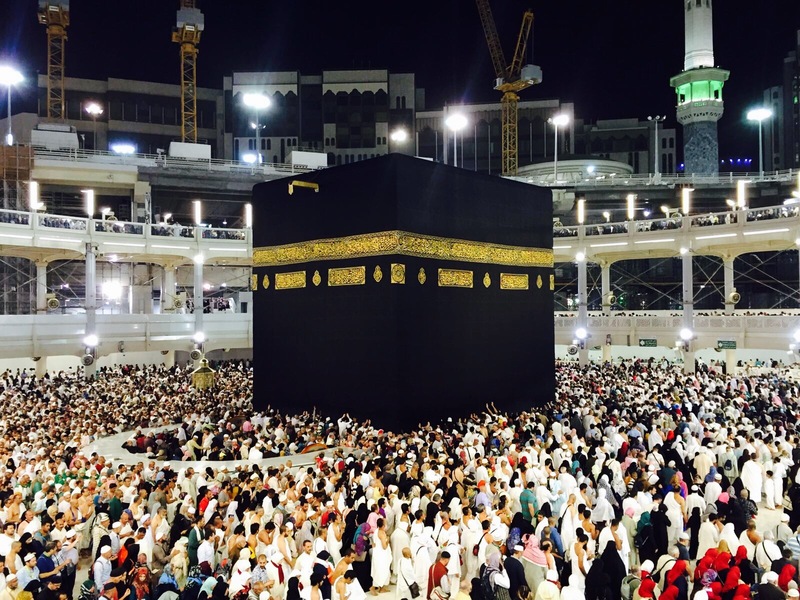 The Tawaf (encircling of the Kabah) was done on the upper temporary platform, where we also stopped and prayed Maghrib. Before we had arrived in Makkah, Baby Z had watched this very scene, photographed below, plenty of times on the television, and we had explained to him that when we were there we would wave at his uncle and aunt who would be watching on TV. As soon as we entered into the space of Kabah, Baby Z sure enough waved as best as he could in hopes that his uncle and aunt were watching, and this surely kept him motivated throughout the Tawaf. Alhumdulillah, once our Tawaf was complete, we moved on to the hills, Al Safa and Al Marwah, which we again travelled between on the higher platforms. Below is the view from above of the hill at Al Safa. It was a challenge, especially with carrying Baby Z through the entire pilgrimage, but we found the strength to plough on through prayer and remembrance of Allah. We also prayed Isha after completing four rounds (out of seven) of travelling between the two hills. Once that was done, we had to walk a fair way before my husband and Baby Z shaved their heads to complete the Umrah, whereas myself and my mother in law chopped off a little inch of hair as soon as we were outside. Though Baby Z did cry whilst his head was being shaved, as soon as he was done he was rather perplexed. I explained to him that Daddy too would be getting his head shaved, and thankfully there was no identity crisis issues due to the loss of hair. The shaving of Baby Z;s hair has definitely made him look much more naughtier, and I must admit, I do miss his mop of light brown hair. It is already growing quite quickly though, so I am sure we won’t have to wait long to get his hair cut again! For now, I am reveling in the fact there are no tantrums to be had for combing his hair! Yipee! 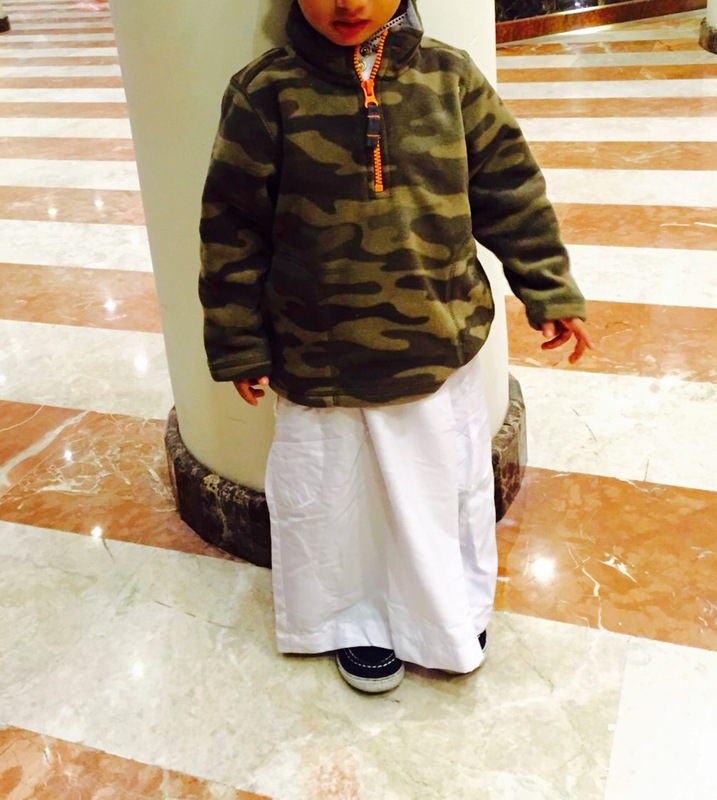 How smart does he look in his little Kandura by the way? The rest of the days flew by quite quickly. 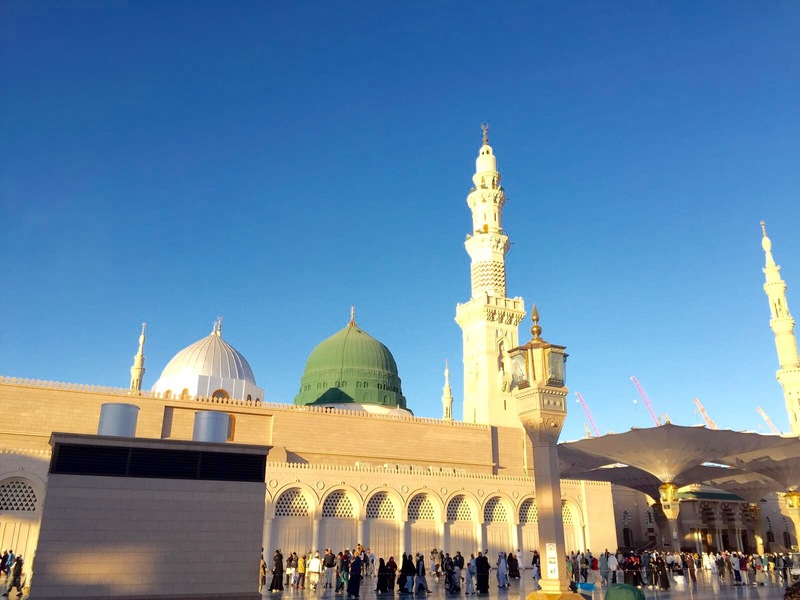 The weather was much more mild, compared to Madinah, and so all our winter wear was packed back into the bags. Baby Z by this point was accustomed to going for prayer, and we would ensure that he would still have his hour or two long nap after Zuhr prayers so that he was refreshed for the rest of the day. There was an abundance of food, though we did find that many people were not able to afford much of it, and we joined in many others who would offer food or drinks to people that needed it. Baby Z wasn’t too happy to see that happen but we managed to give him a slice of pizza to reconcile him. 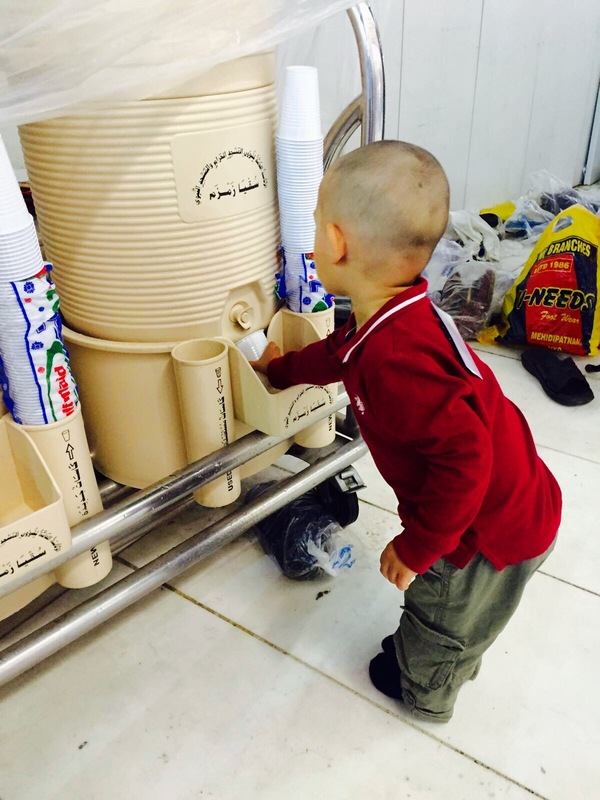 Also, Baby Z would love drinking Zam Zam water from the water dispensers, and would shout and scream until we gave a cup of water if we ever passed by one. If there was one thing I was not prepared for, it would have to be the crowd. It is hard to comprehend but with people from all walks of life and parts of the world, uniting in one place, there are often times when push comes to shove. Literally. 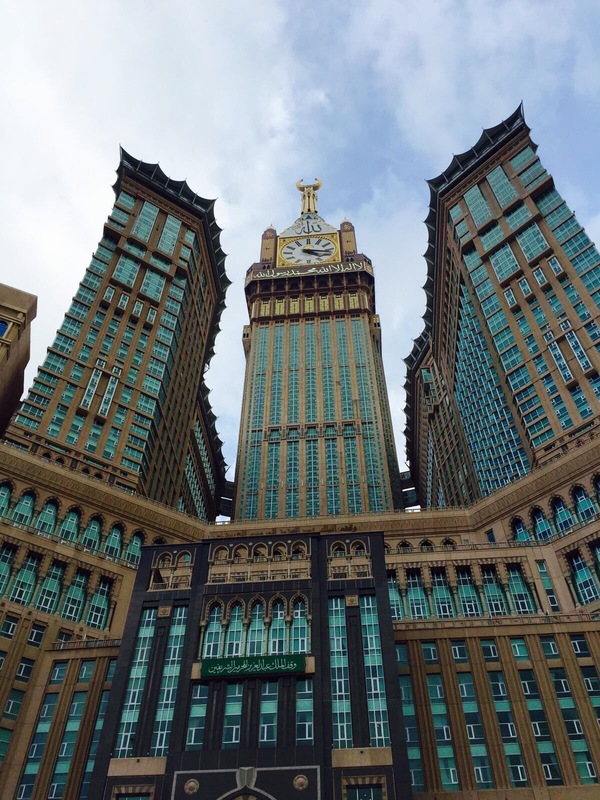 The most challenging aspect of going to Makkah is probably maintaining your patience, and respecting that not everyone understands the correct behaviour or etiquette that must be held in such a sacred place. Having been here so many times before as a child, I think I was well and truly protected by my parents to see this side, and now that I was an adult, I was able to experience the harsh reality that is human behaviour. I was blessed this time around to have had a chance to touch the Kabah as well as pray within the Hateem, also known as Hijr-Ismail, but did not get anywhere near touching the black stone- Hajr-e-Aswad. I was not dissapointed though, as Allah had blessed me to kiss it enough times when I was younger, thanks to my dad who made sure we were able to touch and kiss the precious stone safely under his protection. On the Saturday that we were meant to be flying back to Dubai, we were invited to Jeddah by my old childhood friend’s family, to take a tour of the city before I left. I was apprehensive and had mixed feelings about returning back to my city after 13 years, but we took them up on the offer. It took an hour for us to drive from Makkah to Jeddah and we were at the family’s house by 10 am. It was as if I had entered a time warp. The home of my childhood friend was exactly the way I had remembered it. It was rather nostalgic. They very kindly drove us around Jeddah, showing me the places I used to once visit, as all the memories started flooding back. 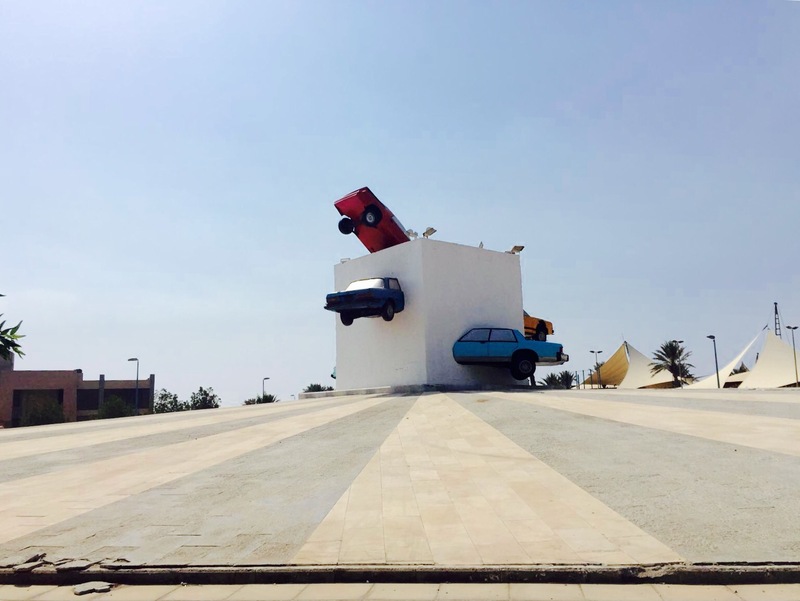 I vividly remembered all the roundabouts that had elaborate sculptures of various kinds in the middle, and yet now they were slightly looking worn out and a lot smaller. It makes sense I suppose since the last time I had seen them, I was tiny myself, and it was quite a long time ago too. It was lovely to see that many areas had developed drastically as well, especially the corniche (seaside) area that we spent most weekends going to. It was such a strange feeling to show my son all the places that I had grown up around, and the feeling of nostalgia was roaring inside me. This was accompanied by happiness, pride as well as gratefulness for having been blessed enough to see so many other parts of the world in the last 13 years. After returning back to their home and sharing lunch, we headed back to Jeddah Airport and returned to Dubai later that night. 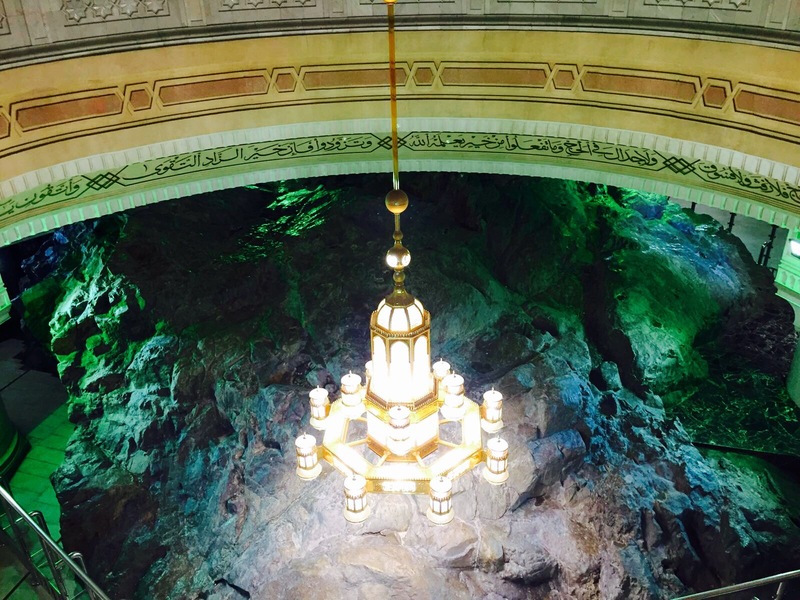 Our Umrah trip has come to an end, but will forever stay in my memory through the sights that I saw as well as this blog post that I share with you all. I hope you enjoyed reading all my experiences, and though it is very long, believe me I could have probably written an entire book on it. 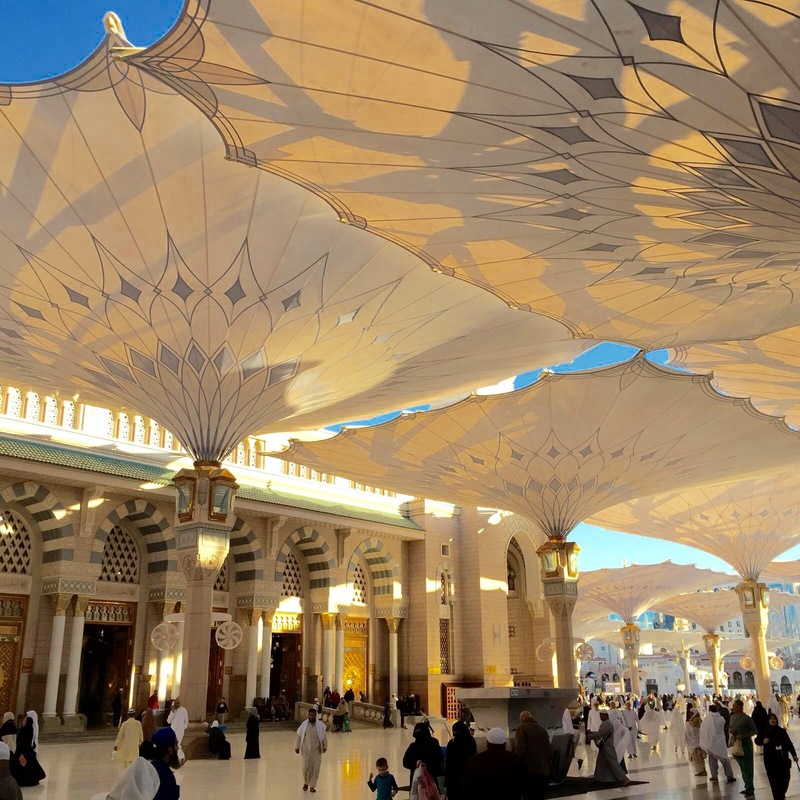 Please feel free to share your Umrah experiences in the comments section below, especially those that involved taking kids for the first time! I would love to hear from you! Thank you. Thank you for sharing this beautiful experience. We have been meaning to go too, so will reference this for later. Thanks for your lovely comment and I hope your Umrah is accepted and easy when you do decide to go, In sha Allah. You’re very welcome… I’m glad you found it worth reading! ? Zeyna, this was a wonderful post – thank you for sharing such a detailed experience. “I was well and truly protected by my parents to see this side, and now that I was an adult, I was able to experience the harsh reality that is human behaviour.” – it’s always humbling to me when I experience those moments of finally understanding all the things my parents did to protect me, especially now that I’m a mother and can see things in a different protective light as well. Thank you so much for your positive feedback and I completely agree! There are some hard hittig truths out there that we face now that we ourselves have become parents! I just hope we can protect our little ones just as our parents did. Thanks for reading! Thank you and In sha Allah you have a lovely Umrah trip. insyallah my family and I will be travelling for Umrah this December. I have one question: is ipad allowed for kids to play with in Haram? And thank you for the wonderful insight of your umrah, writing down tips for myself and my toddler son. Wsalam! I’m glad you enjoyed the post and found it useful. As for ipads, to be honest I didn’t really see many, if any at all. Though there were plenty of phones in kids hands, as I know it can be quite a life saver to keep the little ones busy. I would suggest having earphones with you to make it more discreet, or if possible download the apps and videos on your phone instead of taking the ipad along. By the way, in madinah they dont allow kids toys inside the masjid, so colouring books would be better. Thanks for sharing so amazing article so informative thanks Zeyna S.
You’re very welcome, I am so glad you enjoyed the read and found it useful! MashaALLAH such a lovely article about the truly bond between the parents and child specially among the with the moms..